* Top notes are sawdust and lime. * Just kidding, its called Chocolate Greedy for a reason. Dark (but not bitter) chocolate and orange are the strong top notes. * Imagine if someone took a fresh Godiva chocolate with an orange filling and bottled the flavor as a scent. * The orange fades away and a soft vanilla comes in. It kind of goes from a chocolate candy to a chocolate cake. * It softly fades into a sweet (but not too sweet) chocolate skin scent that lasts more than eight hours. Summary. You can tell I am dieting because I’ve been wearing this and Gourmand Coquin for the past week. Chocolate Greedy is less refined than the Guerlain but still really nice. To do a car analogy, if Guerlain Coquin would be a high-end Mercedes Benz, then Chocolate Greedy would be a mid range Lexus. That being said, if I didn’t already own the Guerlain, I would probably buy Chocolate Greedy because it is so decadent. It is not as in your face as an Amen yet it feels like it could be a brother to Bond I Love NY for All. Since it projects so much for the first hour or so, I wouldn’t wear it to an office unless there is some transit time before you get there. It would definitely be a great nighttime scent for guys or gals as you will attract people who wll just want to lick you all over. And isn’t that the ultimate goal of wearing a scent when going out? 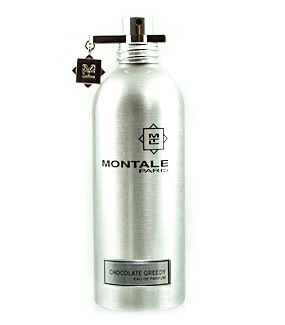 Montale Chocolate Greedy is available from Luckyscent and from the Montale boutique in Paris. Disclaimer: Sample provided by the fabulous Julie Price from http://jewelmakeup.tumblr.com/. Picture is from Luckyscent. That is the ultimate goal of wearing a fragrance when you go out. However, I got licked enough working as a speech therapist in an autism preschool…not awesome. Inappropriate licking is never a good thing.